I found this forum after doing a ton of google research about braces and people's experiences with braces as adults. I'm 43, and I should have gotten braces when I was a teen, but we just didn't have the money. Now that hubby and I are finally in a good financial place, I've started my braces journey. 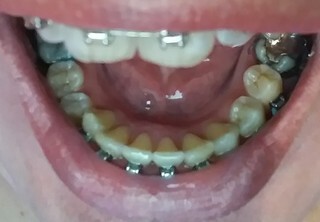 I have a pretty substantial overbite and overjet, but my orthodontist feels like we can get a good result without jaw surgery. I don't need perfect, and jaw surgery is really not something I'm willing to do unless there's a pressing medical reason. I have the self-ligating braces. I don't know if that's just what my ortho uses, or if it's because I'm allergic to latex. Oh, and I also got molar build ups so that my top teeth don't bite down on my bottom brackets. (I'm still learning the terminology, sorry!) It's really difficult to chew because I basically only have four teeth - one on top and bottom on each side - that can chew. I tried to bite into a banana, and that only caused sadness. I am really looking forward to one day being able to chew with all of my molars. Hi - your story reads much the same as mine, except that I’m a year into treatment. The bite build ups you get used to. My orthodontist didn’t even forewarn me about them, and it came as quite a shock that I couldn’t chew properly. Nowadays there is very little food I avoid. It just takes time getting used to them. Good luck with your treatment, it’s never too late to straighten your teeth. Thanks for the welcome, AndAndAnd. I'm relieved to know that the chewing will get better, or at least I'll get used to it. I'm looking forward to more substantial food. My daughter and I went to the local comic-con today. We had fun, bought too many things, and then went to the mall to buy more stuff. We went out for lunch, and since my teeth are sore, my options were limited to soup and grilled cheese. I had to tear the grilled cheese into pieces so I could mash it. I bought some spam spam spam floss after seeing a video on it. I am having a horrible time with the floss threader, so I thought these would work better. They do fit under the wires, so it was nice to floss. I had a cleaning the day after getting braces, and even the hygienist wasn't able to floss my back molars. Supposedly, one is supposed to be able to floss between molar bands, but I can't get the floss between the bands and teeth next to them. Are they just too tight still, or am I not doing it right? I've been using my water flosser a lot in those areas. I'm looking forward to my teeth not being sore. With the extractions, the spacers, and now this, I'd just like a day or two without pain. Hey congrats on starting your treatment. Keep us updated! So it's almost two weeks since I got braces. Last week was the first week back to grad school for Spring Semester, and most of my cohort was excited to see my braces. A few of them asked me why I got braces, so I got to share my story with them. I haven't had to use any wax at all (knock on wood). Sometimes I wake up and actually have forgotten that I have braces. My cheeks may have already been scarred from when my top wisdom teeth were too far back and just scraped them incessantly. I'm a little concerned that they aren't as uncomfortable as I was expecting. Like, are they working if they don't hurt? Oh, hubby took me out last night and I was able to bite into my burger. Small bites, but bites nonetheless! I was so happy, until I had to clean out everything that got stuck in my braces. So these pics are from two weeks after I was braced, so almost two weeks behind where I am now, but honestly, I just ate pizza and haven't done my post-meal clean-up yet. I was online checking things for class and got the itch to finally post some pics. This is the front before. As I mentioned before, I have both a significant overbite AND overjet. This is the bottom from before. You can see the spacers I had. Those sucked, btw. So definitely some progress. My braces haven't been painful at all, so I was worried that nothing was happening. My overjet has been brought down a noticeable amount. 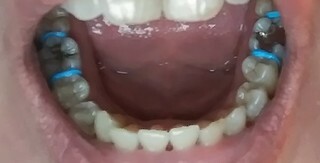 Also, on my bottom teeth, I didn't even realize I had some crooked teeth, and those are on the way to straightening out. No progress has been made on closing my extraction gaps, but the brackets as set now on the top and the way the wire is set isn't set up to do that yet. 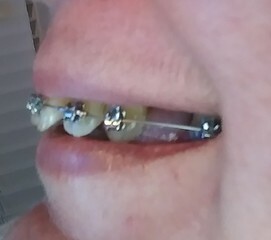 I have my first wire change and first appointment with the ortho since I got braced on Feb. 20. That is super fast progress! I can't believe that's only a couple weeks. How long of a time line did they tell you for a total? He said 24 months. 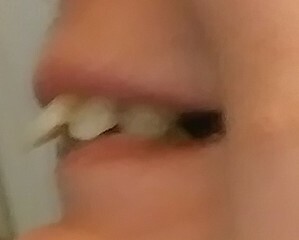 Once he gets the front teeth where they belong, there's still a lot left to do to fix my bite. I think he's trying to get my right canine to recede some, and also to bring up some molars on the bottom. Wow lookin good! You make me feel better since I'm 27 and just got braces for the first time. So today I was very naughty and snuck some of hubby's soy sauce and wasabi almonds. I ate one, and it went okay, so then I grabbed a few more, and BOOM! Broke a wire. I called the ortho's office and went in. Since I have an appointment scheduled next week, the assistant was going to go ahead and change my wire, but NOPE! The ortho decided to hold off on my wire change until the next appointment, which is March 25. Ugh. I really wanted to switch wires. Anyway, don't eat almonds, lol. Isn't it crazy the huge list of things you can't eat? Possibly the worst part of it all haha. And you should be happy. You convinced me, I'm getting my spacers installed today to make room for braces.